Apart from pd-l2ork, L2Ork project has resulted in another focus area arguably worthy of a post of its own: K-12 (kindergarten through the 12th grade) educational outreach. 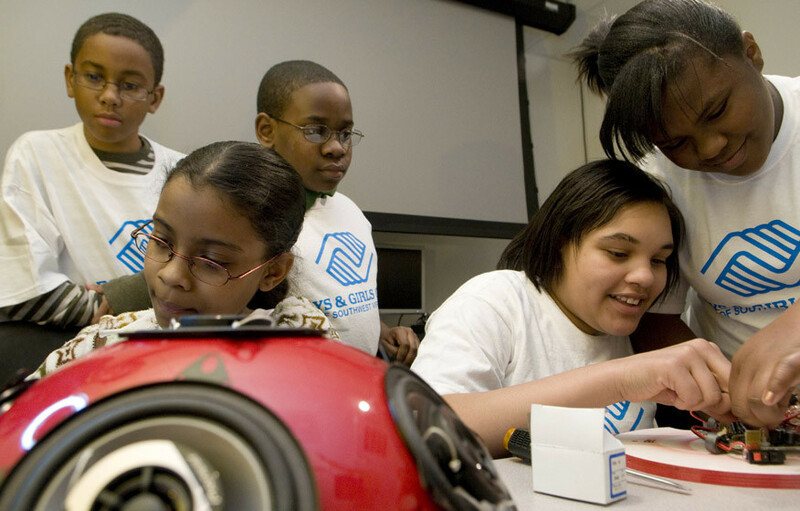 In the winter 2010 L2Ork partnered with Boys & Girls Club of Southwestern Virginia for the purpose of enriching organization’s afterschool programs that service predominantly inner city underrepresented population. As part of the newfound initiative, students participated in the assembly of their own laptop stations, including handmade hemispherical speakers fashioned out of IKEA salad bowls we lovingly named ladybugs. Once the hardware design and configuration was complete, the project focused on engaging students in adapted L2Ork compositions, as is the case with the Citadel video footage above. As the project evolved, my undergraduate research assistants and I began complementing program with arrangements of mainstream works for the student ensemble. In the spring 2012, with the introduction of pd-l2ork’s K12 learning module students were given an opportunity to program their own instruments. The same year we also introduced a week-long ICAT Maker camp series where student participants could collaboratively ideate new musical instruments, design and construct them using a combination of 3D printing and cardboard challenge, program a new sound-making instrument using pd-l2ork, utilize Arduino board with LEDs, servos, and input sensors, and finally connect Arduino to pd-l2ork, so that the Arduino sensor data can control the instrument output, as well as for pd-l2ork to provide feedback by manipulating LED and servo voltage. Once the instrument was completed, students would compose and rehearse a new work for their instrument and present it as part of a performance showcase. Since 2012 we’ve had an opportunity to organize over dozen workshops and camps focusing on some variant of this model, including 2014 Raspberry Pi Orchestra summer gifted program for Virginia Montgomery County Public Schools, and 2015 K-12 teachers Maker camp designed to train teachers in this integrative approach to learning. Other variants of this model found its way into higher education community-driven art installations, such as Cloud, engaging participants of practically all ages. The same model was also implemented in my college-level teaching, thereby providing opportunities for students to compose for L2Ork. Another unsuspecting outcome of this exciting journey was setting the foundation towards what I would like to refer to as Integrative Design, Engineering, Arts, and Sciences (IDEAS), which, unlike traditional Science, Technology, Engineering, and Math (STEM) approach to learning emphasizes integration of all four STEM areas, using arts and design as the catalyst and motivator in a form of a single integrative task. Since 2013 my colleagues specializing in STEM learning have also expanded our learning assessment methodology as a means of measuring learning outcomes, as well as paving way towards comparing IDEAS concept with existing STEM approaches. Bukvic. I. (2014). Pd-L2Ork Raspberry Pi Toolkit as a Comprehensive Arduino Alternative in K-12 and Production Scenarios. New Interfaces for Music Expression (pp. 163-6). London, UK: NIME. Sawyer, B., Forsyth, J., *O’Connor, T., Bortz, B., Finn, T., Baum, L., Bukvic, I., Knapp, B., & Webster D. (2013). Form, function and performances in a musical instrument MAKErs camp. ACM Special Interest Group on Computer Science Education (pp. 669-674). Denver, Colorado: ACM. Bukvic, I., Baum, L., *Layman, B., & *Kendall, W. (2012). 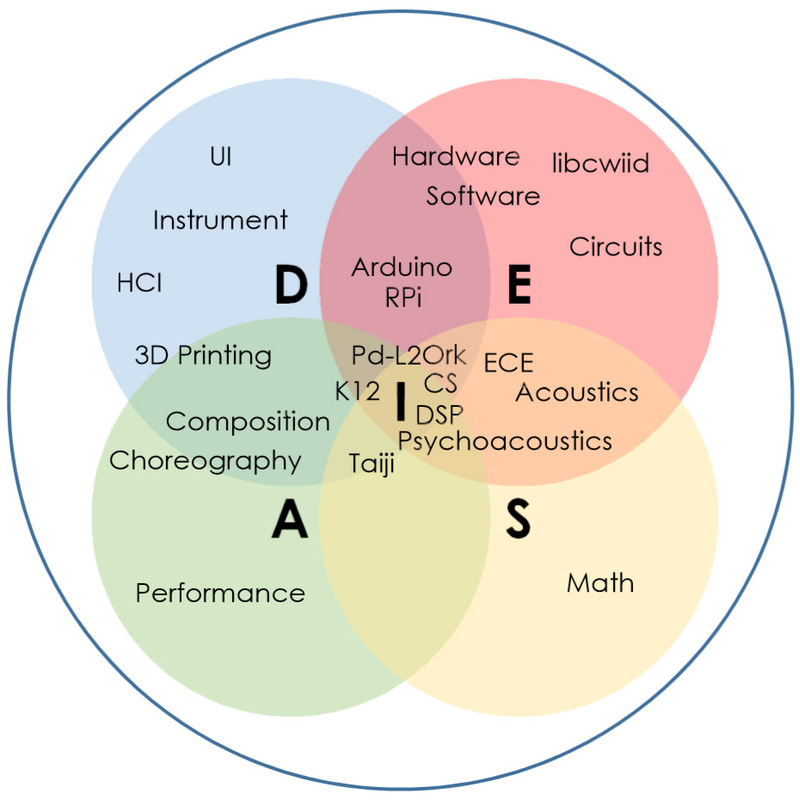 Granular Learning Objects for Instrument Design and Collaborative Performance in K-12 Education. New Interfaces for Music Expression (pp. 344-346). Ann Arbor, Michigan: NIME.